Online Ventures Group have confirmed their sponsorship of the Audio Visual equipment at our 25th Birthday with Metronet UK. The event will be held at Manchester’s iconic Midland Hotel on 20th February 2015 and OVG have kindly sponsored the visual presentation and audio equipment throughout the evening. Led by an innovative approach to the use of and presentation of data, Online Ventures has very quickly become an important online marketing hub in the business community of Manchester. Their ethos of kindness, hard work and undeniable online marketing knowledge has propelled them to the forefront of the digital landscape of the city in record time. Earlier in 2014, Online Ventures gifted Forever Manchester a new website in celebration of our 25th year and they have continuously supported us through their Manchester Million contribution and other activities such as Caketober. Ambassador, Lauren Dale is also their Senior Relationship Manager. 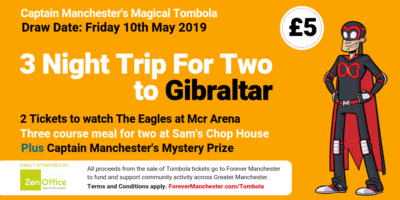 If you are interested in sponsoring the event please contact our Head of Business Development Jean Mills on jean@forevermanchester.com or call 0161 214 0940. To see which sponsorship opportunities are still available visit our sponsorship page here. There are also tables and tickets still available for the evening. To purchase yours visit our event page.